Warranty With an industry-leading, two-year limited warranty, you can focus on growing your business. Support Aspen Communications and AT&T Synapse product support team are best-in-class and prepared to keep your business running smoothly. Financing Attractive financing options make Synapse easy to implement, regardless of your budget. 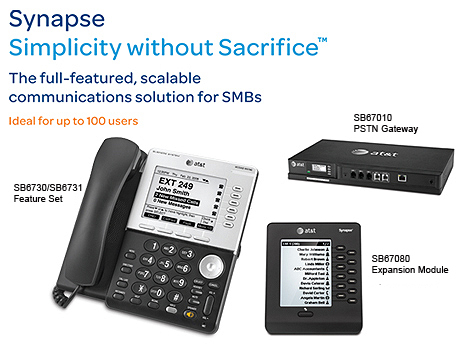 The Synapse difference – No matter what your trade—whether construction, real estate, healthcare, manufacturing or IT—you’ll love the big-business features and small-business price of AT&T Synapse. Increase sales Direct your customers to the right person every time. With voicemail-to-email you’ll never miss a lead. Give yourself more time to manage your business You can with professional automatic attendants, advanced call handling and built-in voicemail. Improve operations Still running your business with a key system, legacy equipment or cell phones? Make the simple switch to Synapse, and you’ll love the advanced, easy-to-use features, large displays and DECT 6.0 cordless mobility. Grow your business with no hassles or hidden fees It’s doable with support for up to 100 users, PBX functionality, remote office support, IP services and more.